The 576 designed by Concepts Tannery and New Balance (previously) drops this Saturday June 30th at the Concepts store in Cambridge, MA. Also look for the matching t-shirt. This entry was posted on Thursday, June 28th, 2007 at 2:43 pm and is filed under 576, Limited, USA. You can follow any responses to this entry through the RSS 2.0 feed. You can leave a response, or trackback from your own site. I collect New Balance sneaker since 1984 and some of my favorites are the New Balance 1300 from 1985, the 670, 700, 770 from 80´s and the New Balance 577 Thomas I Punkt from 2007. I think, the New Balance 576 “The Tannery Collab”-sneaker with the 3M-yellow-refelective-parts and the leather-material-mix is one of the best shoes in the last few years from New Balance! Absolutely great design! We are the same type! I had this Tannery Collab also, great shoes! I’m a NB fans, absolutely. How much for the Thomas I Punkt 577? I have requested a mail to I Punkt, but no response yet. These are awful. Poor imitations of the Swedish Flag SNS 577’s. 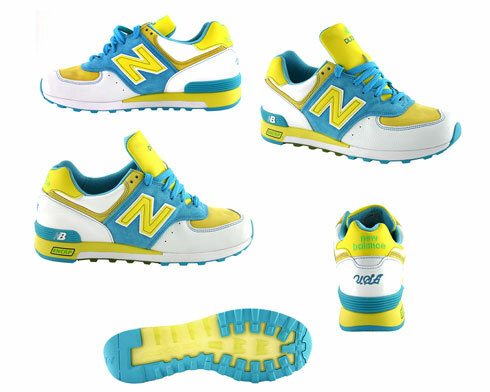 Hi ERic, the New Balance Thomas I Punkt 577 (both versions) is sold out and they haven`t ship international, they are only sell in the store! If you have any question to the available sizes and the price, you can send me an e-mail to nicki1970@gmx.de. where the hell do i buy theese, i am looking everywhere???????????? ?